- These glow pebbles absorb and store energy from sunlight or other light sources and light up in dark environments. These driveway stone absorb enough sunlight or other artificial light during the day to glow up to 3-6 hours at night or any other dark environment. Please radiate them with light again if they are not bright enough. - No electricity or battery needed. Our glow garden stones are made of natural resin, non-toxic, non- radioactive and odorless. Fine workmanship and polish so there is no sharp edge. - You can use these glowing stones to line a walkway, pathway or driveway, edge a flower bed or fill potted plants with these glowing pebble stones. Creating DIY decoration for vases, fish tanks, aquarium ornaments, gardening, swimming pool, pond, bar decoration, home, park, waterscapes, landscape, planter, potted plants pots, patio, lawn, yard aquariums, crafts decorations. - You just pave them along the pathway and these pebbles will emit a brilliant glow after absorb enough sunlight or other artificial light during. These glow pebbles transform your garden into a beautiful and dreamy landscape. We promise every good effort products to make sure your satisfaction. We make every effort to provide quality services. You could contact our customer service when there any questions. Not satisfied? 100% guaranteed return of goods. AUTO GLOW IN THE DARK GARDEN PENNLES: These glow pebbles absorb and store energy from sunlight or other light sources and light up in dark environments. These luminous pebbles absorb enough sunlight or other artificial light during the day to glow up to 3-6 hours at night or any other dark environment. Please radiate them with light again if they are not bright enough. SAFE AND ECO-FRIENDLY: No electricity or battery needed. Our glow garden stones are made of natural resin, non-toxic, non- radioactive and odorless. Fine workmanship and polish so there is no sharp edge. PERFECT FOR INDOOR AND OUTDOOR DECORATION: You can use these glowing stones to line a walkway, pathway or driveway, edge a flower bed or fill potted plants with these glowing pebble stones. Creating DIY decoration for vases, fish tanks, aquarium ornaments, gardening, swimming pool, pond, bar decoration, home, park, waterscapes, landscape, planter, potted plants pots, patio, lawn, yard aquariums, crafts decorations. BUILT YOUR ROMANTIC GARDEN: You just pave them along the pathway and these pebbles will emit a brilliant glow after absorb enough sunlight or other artificial light during. These glow pebbles transform your garden into a beautiful and dreamy landscape. 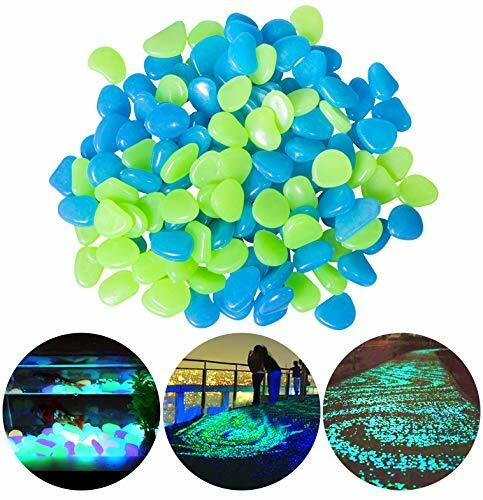 RISK FREE GUARANTEED: Package includes 100Pcs blue and 100Pcs green Glow in the Dark Pebbles. Quality guarantee and 5-star customer service. If you are not 100% completely satisfied with your glow pebbles, simply let us know and you will be offered a FULL refund or replacement. If you have any questions about this product by CandyHome, contact us by completing and submitting the form below. If you are looking for a specif part number, please include it with your message.